Millions of miles of pipelines criss-cross the United States alone, and when they become fouled by the likes of bacterial colonization or corrosion, the flow of fuel is reduced — causing tremendous energy loss. In fact, undesirable interactions between liquids and surfaces create problems just about everywhere liquids are handled or moved around: in fuel or water pipelines, medical tubing, power lines, and more. But there is hope for drag-free transport in a material called SLIPS that repels just about anything it encounters, and has been created by a team at the Wyss Institute at Harvard University and Harvard’s School of Engineering and Applied Sciences. Yesterday, the U.S. Department of Energy’s Advanced Research Projects Agency-Energy (ARPA-E) announced that a team led by Joanna Aizenberg, Ph.D., at the Wyss Institute, with support from Wyss Postdoctoral Fellow Tak-Sing Wong, has been selected to receive an innovation grant to further develop this slippery coating. The award is part of a $130-million funding effort by ARPA-E through its “OPEN 2012” program, designed to support innovative energy technologies. SLIPS technology is inspired by the slick surface of the insect-catching pitcher plant. 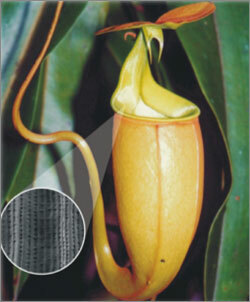 SLIPS, a technology inspired by the slippery surface of the carnivorous pitcher plant, creates novel super-slippery surfaces that can quickly repel liquids and solids and also have a unique ability to self-repair and to self-clean. Non-toxic and anti-corrosive, SLIPS is proving effective on almost any surface, including glass, plastics, and metals, and in a range of harsh conditions, such as high pressure, freezing temperature, extreme UV exposure, and high acidity. Under the proposed ARPA-E-funded work, the SLIPS technology will be leveraged to create novel pipeline surfaces that enable the energy-efficient transport of economically important fluids such as crude oil and biofuels in a range of temperature conditions. The reduced friction enabled by SLIPS has the potential to reduce energy use by up to 50%. SLIPS may also have the potential to create new antifouling coatings for water pipes and the hulls of ships, where barnacles and other marine species significantly increase drag, reduce fuel economy and speed, and therefore increase overall transportation costs. Aizenberg is a Core Faculty member at the Wyss Institute, the Amy Smith Berylson Professor of Materials Science at the Harvard School of Engineering and Applied Sciences (SEAS), Director of the Kavli Institute for Bionano Science and Technology at Harvard, and Professor of Chemistry and Chemical Biology in the Department of Chemistry.